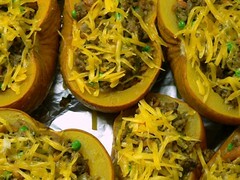 MY DAILY PUMPKIN RECIPE: Pumpkins stuffed with wild Mushroom Sage and Cheese. Pumpkins stuffed with wild Mushroom Sage and Cheese. I used a parmesan cheese for this recipe but any sharp cheddar would be lovely and in the past I have also made it with gorgonzola. I sometimes add cubes of boiled bacon or ham for flavour. Halve the butternut squash and scoop out the seeds. Rinse and pat dry, inside and out. Mix a tablespoon of olive oil with 1/4 teaspoon of sea salt and a few turns of a peppermill. Rub your fingers in the oil, then coat the inside of each pumpkin. Set pumpkins aside. Saute the leeks, celery, garlic, and mushrooms in the butter, and cook until the mushrooms have released all their moisture. Stir in the pepper, thyme and sage. Add the stuffing cubes and poor the ale over the cubes. Toss the stuffing until it is combined thoroughly and the cubes have absorbed all the moisture.